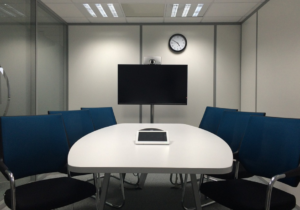 Whether your company invests in a high-end videoconferencing system or a basic room solution, achieving the best possible image quality will help you get the most out of your technology investment. To accomplish this, there are at least five questions about the videoconferencing room that owners must answer to get the best results from the systems they purchase. How can we recognize and avoid setup problems that lead to image degradation, including silhouetting, poor color and lack of sharpness? Can we provide a more professional room environment that minimizes distractions? How do we ensure that image quality is high enough to read facial expressions? Can we help users feel more confident about their appearance on video? How can we improve eye contact and with it the emotional factors that affect team dynamics? This paper will provide answers by looking at how movement, clutter and color can affect video quality; how lighting affects color and the ability to see facial expressions; how windows can affect color and the camera’s iris; methods of providing clear identification of meeting participants; and factors affecting visibility and eye contact. For additional questions about videoconferencing or assistance with your next A/V project, consult the experts at Trinity Video Communications at 1-800-261-9008. Trinity Video Communications provides video, audio and other communications options for commercial, healthcare, education and government applications. Trinity has a number of government contracts and holds a GSA Schedule 70, with 75% of its employees holding top-level security clearance. Trinity Video Communications specializes in secure, mobile applications, linking any device anytime, anywhere.